The Charvel Pro Mod So Cal Style 1 HH FR Left Handed Guitar in Black offers the same exceptional playing feel for lefties. If you are looking for a model that accentuates precision whilst exuding a calm and collected character, then you're going to love the laid back So-Cal Style 1. 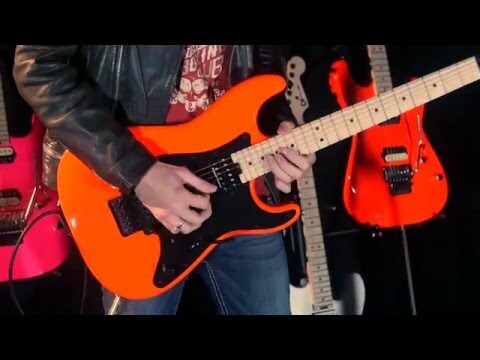 Fusing together stability and style in an affordable model isn't easy, but Charvel have clearly mastered their art. Ergonomically designed to suit left-handed players, you can finally relax into a model that plays like a dream. Shaped to a deep double-cutaway profile, the body has everything you could want to pave way for a supportive playing experience. The Pro Mod So-Cal Style 1 is crafted using alder, a highly resonant tonewood that offers a wide range of tones to play with from throbbing low-end to shimmering highs. The black finish is coated using gloss to preserve it for as long as possible. Added protection around the pickups and towards the lower bout is afforded by the single-ply black pickguard. If it's sweeping dive bombs and lofty wailing that you're after, you'll be please to find the Floyd Rose FRT-O2000 double-locking recessed tremolo and FRT-O2000 locking nut. The Floyd Rose system allows you to play around with your vibrato to your heart's content, safe in the knowledge that your strings will return to position with tuning intact. Knurled flat-top control knobs guarantee that when making adjustments on-the-fly, your fingers will achieve greater purchase on the knob for smooth attenuation. Whatever your level, everyone is bound to fall in love with the Charvel Pro Mod So Cal Style 1 HH FR Left-Handed Electric Guitar in Black.